In a previous article we have seen that Nigeria and Mauritania are competing for the first wind farm in West Africa, respectively with a 10 and 4.4 MW project. Now it seems that Mauritania is taking the lead with a second project, but this time in premiere-league with 30 MW. The Mauritanian industry and mining company SNIM, which hired Valorem to prepare the studies and to supervise the construction of the 4.4 MW wind farm in Nouadhibou at the extreme North of the country, is now planing to commission in October 2013 a second 30 MW wind farm south to the capital Nouakchott. Valorem offers again the engineering and consulting services. One can estimate the total investment to 45 million €, taking into account a nominal cost of 1,500 €/kW. The 2011 peak load of the Mauritanian interconnected network reached only 70 MW. At night during the cool season the load drops down to 25 MW, less than the wind farm installed capacity. 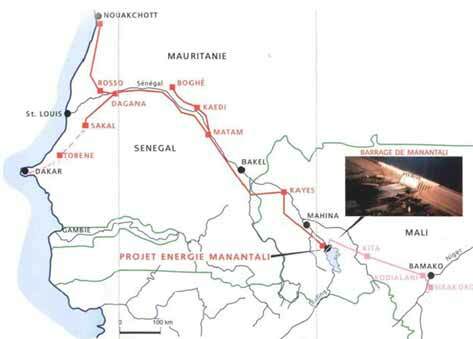 Hopefully Mauritania is interconnected with Senegal and Mali through a 225 kV single circuit overhead line being part of the OMVS network that was built to export the energy produced at the 200 MW hydro power plant located at Manantali in Mali (see opposite map). There is therefore no technical issue to export the excess energy to the two neighboring countries, at the condition that the single HV circuit overhead line is available, which is not always the case. For some people in Mauritania there is no need for export. Major industrial projects would soon grow in the desert. New factories would add enough electricity consumption so that there will be no excess energy to export. Fifteen years in Africa have shown me that projects developers and officials are extremely too optimistic when it concerns industries development. It would take years to start running the first factory in Mauritania. One might object that same optimistic attitude is often adopted when estimating power plants project schedule. Fair enough. But SNIM particularly need more energy to develop its mining activities. Raw material international market prices are high. It is the right time to SNIM to invest in increasing its production. An incentive stronger than investing in factories in Mauritania. SNIM needs power to develop. They then have to build new power plants. First, the Mauritanian utilities Somelec does not have a National Load Dispatch Centre (NLDC). The operation of the network is done manually (the operator uses a computer mouse to control active and reactive power production as well as circuit breakers. There is no automation) and power plants operators communicate on the phone. Yes, we live in the XXI Century. Shocking, isn’t it? The good news is that another project of a new 120 MW power plant located north to Nouakchott is undergoing and also requires a NLDC. Somelec is well aware of the situation and is doing everything he can to find a solution to fund the construction of the NLDC. One can reasonably hope that the NLDC will be ready before the wind farm. Second, there is no network close to the wind farm location. 33 kV underground cables or overhead lines must be installed to connect it to Arafat substation, the closest one located 11 km away. The problem is that the substation is very old and in bad shape, and no spare feeders are available. Additionally it belongs to Somelec, not to SNIM. A new switchgear must then be installed. It wouldn’t be technically difficult because there is enough free space inside the substation fence. But an agreement shall be achieved between Somelec and SNIM (who pays for what? What belongs to whom?) Negotiation could require much more time than building the wind farm. So, nothing technically insurmountable, but not easy to manage. The major threat shall be searched out somewhere else. At which tariff shall be sold the energy produced by SNIM to Senelec and/or EDM, the Senegalese and Malian utilities? How much shall be paid to SOGEM, the OMVS operator, for using its network? And Somelec, what would be its share? None of these crucial questions was yet raised. Why? Because they are extremely difficult to answer. On one hand, the legal frame is complicated, not only because of the implication of three countries, but mainly because the laws applicable to the energy sector are not prepared to address such a case. On the other hand, it took ten years to the Senegalese, Malian and Mauritanian authorities to agree on energy tariff and respective allocation of the energy produced by Manantali. One can hope this time the negotiations between SNIM, Somelec, SOGEM, Senelec and/or EDM and the three national authorities will not last as long. But I am not sure it can be done before the wind farm produces its first kWh.